Benny and Suzanne Hinn have confirmed more details about their upcoming remarriage, including date, place, and who will oversee the ceremony. 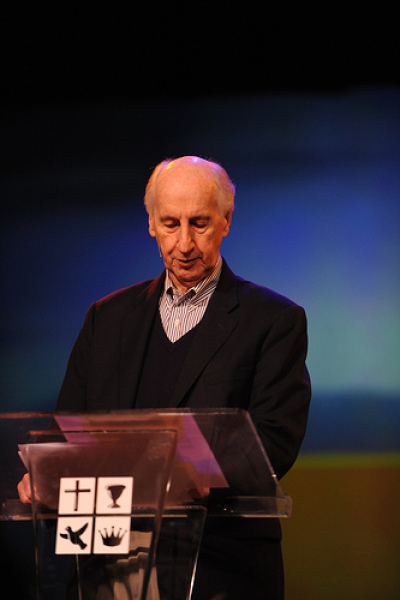 Jack Hayford, a Pentecostal minister who is chancellor of King's University in Los Angeles and leader of Jack Hayford ministries, will oversee the ceremony. Benny Hinn has credited Hayford with helping to restore the marriage of the Hinn couple, who divorced in 2010. "You wake up to the fact that you need your wife, and she wakes up to the fact that she needs her husband," said Benny Hinn on a recent episode of "The 700 Club." "I have always loved this girl and she has always loved me. We never broke the covenant. Our marriage has been restored. We just want to make sure that we don't repeat the same mistakes." The remarriage has been announced to take place on the evening of Friday, Oct. 26, at Calvary Assembly in Orlando, Fla. – the church that Suzanne Hinn's father once served as lead pastor. After about 30 years of marriage, in February 2010 Suzanne filed for divorce from the famous prosperity faith-healing preacher. Court documents cited irreconcilable differences as a reason. Hinn, who frequently travels the world performing faith healings and delivering speeches, had claimed at one point that it was his time away from his family which caused the marital problems that led to the divorce. A year after the divorce papers were filed, some sources claimed that the root cause of the dissolution of the marriage was due to infidelity on the part of Benny Hinn. In late May, Hinn announced that he and his ex-wife had reconciled. In a statement on his website, the charismatic preacher said the process had begun last Christmas. "Our God is a God of restoration and reconciliation. The cross is the ultimate symbol of His unending yearning to reconcile man to God and will be our only hope for healing," reads the statement. "I know, for I experienced this healing when I gave my heart to my precious Master Jesus so many years ago; but I have experienced His healing touch more recently when He began His glorious healing work in my own family, as the process of restoration in my marriage has begun." In June, Hinn mentioned on his ministry's website that a leading factor in the 2010 divorce was Suzanne's struggle with an addiction to prescription medication. "Suzanne started taking certain prescription medications to help her cope with some of her personal struggles. She became dependent on those for nearly 15 years, and those medications made her behave erratically at times," wrote Hinn. "As her husband, I did not know the extent of her reliance on these medications, nor did I fully understand just how much harm they were causing to her, physically and emotionally." The first wedding of Benny Hinn and Suzanne Harthern took place in 1979 at a facility now called Calvary Family Life Center.